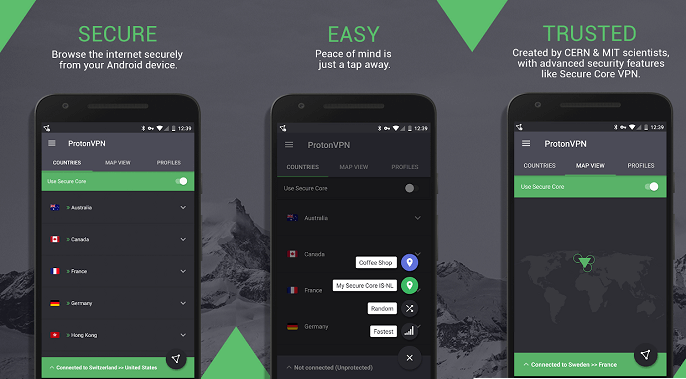 If you choose ProtonVPN as your VPN for Android of choice, you will be getting an excellent app that is completely free. It hits a sweet spot with no advertising or premium upgrades. Of course, just being free is not enough; it also needs to be good. Luckily, ProtonVPN is excellent free VPN for Android. The app boasts unlimited use and a wide range of global servers to ensure you can always connect. We also like that the developer makes its logging policy clear – stating that the app does not log – making it a good security choice. Among the core features are a re-routing system, fast speeds, and even support for Tor. Our one gripe with ProtonVPN is that it is still a relatively new service, so you may experience some bugs. These are never hugely problematic and are only on an app level, but do pop up occasionally. 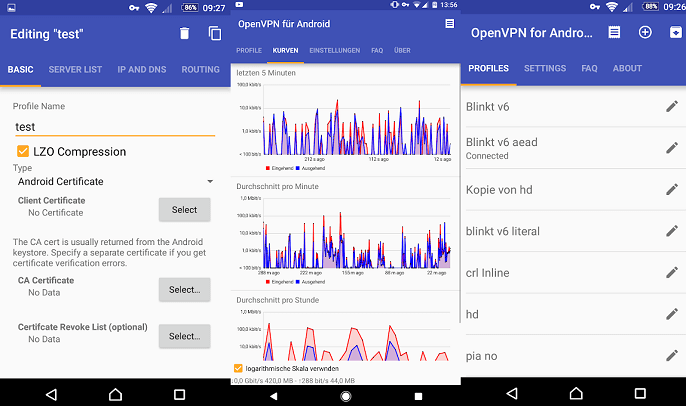 OpenVPN Connect is one of the best VPN for Android that is also available on any other platform as well. It is more than capable of matching paid services in terms of what it offers. The open source service has some important features, such as the ability to import .ovpn profiles and support for PolarSSL. 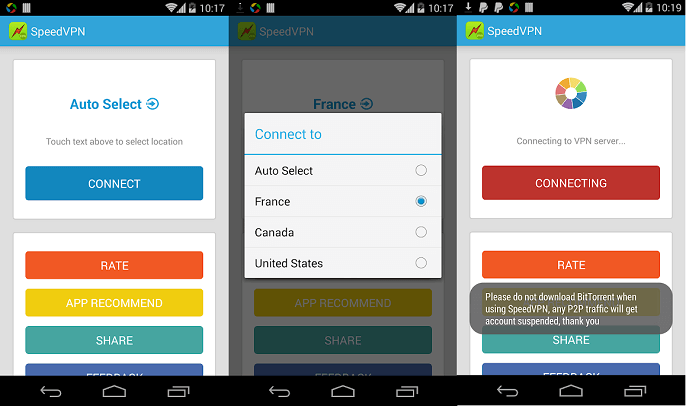 The app is also a solid bet for a secure VPN for Android service thanks to its enterprise-grade encryption servers. It is worth mentioning that there are two OpenVPN applications on the Google Play Store. One is the Connect service and the other is OpenVPN for Android. As the name suggests, the latter is the Android-specific app – and it’s the one we recommend. The features are identical to the normal Connect experience, but the Android-focused app is a little easier to use. Still, in both apps you will need create and set up your own OpenVPN server, so there is a learning curve to this service. SurfEasy Secure Android VPN is one of the newest VPN apps for Android and is getting some consistently good reviews on this mobile platform. Some of the interesting features that make the service good to use are an ad blocker and visible Wi-Fi network security information. Five server locations provide the heavy lifting when trying to connect. The app is developed by a subsidiary called SurfEasy Inc., it is good to know the service is backed by the internet and browsing giant. Despite this, SurfEasy Secure Android VPN does not offer clear information on logging, so we advise a closer look at the policy when you download the app. This is also a simple free VPN for Android that we would categorize as ideal for quick personal use. There are no pro-level features like torrent support. Some free VPNs on this list require manual adjustments, which is not ideal for beginners. Many people simply want to be able to open an app and get up and running without too much thought. That’s where SpeedVPN comes in as it allows you to connect to a VPN with just a single press of the screen. No settings, unlimited connections, and no registration – this is a free VPN for Android at its most efficient. The app also has a unique feature whereby it will boot you from the network after 60 minutes. You can reconnect before and do this as many times as you want. The reason for this is to keep bandwidth fast for active users. Sure, it is a bit of a pain to get booted, but reconnecting takes a second and it is a good way of ensuring rapid networks. While SpeedVPN is most definitely free, in this case it comes at the cost of ads – and sometimes including the pop-up ones where you have to wait to close them. 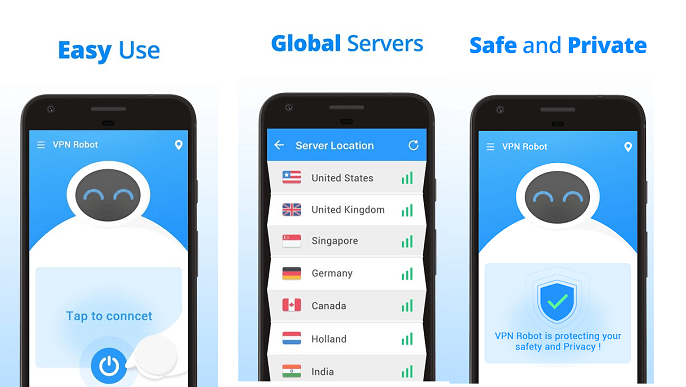 With over half a dozen server locations and thousands of servers, VPN Robot is able to deliver unlimited bandwidth and some really fast connections. It is one of the fastest and best VPN for Android services available for free we have tested and like the others on this list it is completely free, albeit with ads. The developer says it uses shield guard protection and never records information or shares it. With internet traffic encryption coupled with that promise, VPN Robot is a solid choice for those wanting a higher level of VPN security. One issue we found with VPN Robot is that it would not always connect. When it did, the speed was very fast, but sometimes it could not seem to find a server to connect to. Whichever free VPN for Android you pick, make sure you have a portable charger at your disposal as VPN apps consume plenty of battery resources on your device. However, that is fair price you pay for the anonymity while using your smartphone. 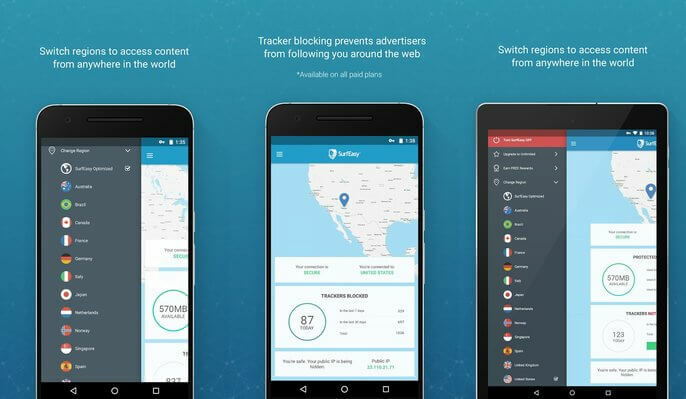 Tags: best free VPN for Android, best VPN for Android, free VPN for Android, OpenVPN Connect, ProtonVPN, SpeedVPN Free VPN Proxy, SurfEasy Secure Android VPN, VPN Android, VPN apps for Android, VPN for Android, VPN Robot - Free Unlimited VPN Proxy &WiFi Security. Thanks for researching for us. In my opinion, VPN world is one of the best options to use over the use, with advanced level features. And besides that, you can easily bounce the network, with the help of the VPN, and IP address never can be tracked.